Many years ago, 2,500 B.C. 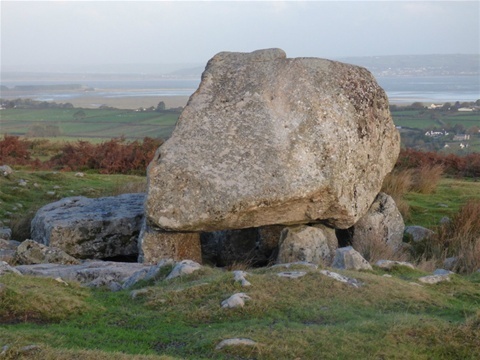 in fact, a burial tomb appeared on top of a hill, not far from our home for waifs and strays. But as a child, my father took me to the tomb and told me of another tale, of how it came to be. ‘King Arthur found a pebble in his boot, as he travelled with his men on the other side of the estuary,’ he said as he lifted me up onto the great smooth surface they called a tomb, ‘and he threw it across the sea where it landed right here on Cefn Bryn!’ he smiled as he nodded and I remember looking across the estuary to the land on the other side. He must have been a great shot, I thought, for the stone to have flown through the air for seven miles! I guessed it was his strength that made him a King! Being a child with an extraordinary vivid imagination (you can see where it came from) I believed every word my father said. And so it was, I climbed, slept and picnicked on that ancient tomb but as the years passed, I began to have my doubts about King Arthur’s tale. I stopped by that stone early this morning, when the wind blew hard and a watery sun struggled to shine. My hands trembled with the cold (or the memory) and I had trouble holding my camera still. I pictured my father standing there telling me the story and once again I was that child. I guess if I listen to my heart, then the tale of King Arthur’s Stone is almost certainly true!